It was only last weekend when my wife and I went to London on a coach trip for the day. Stopping over night at the Waldorf it was really great. In the hotel you felt as though you were stepping back in time. The doormen who were wearing their traditional dress long coats and bowler hats. Ushered us in nothing was too much trouble for them. After we checked in we went to a show in the afternoon Thriller. Which was also great the only problem was the seats were very tight. Your knees were very cramped and you had to sit at a slight angle. But it was well worth it the show was great. It was totally packed it didn’t seem to matter how you were wedged in it was a great show. The next day we had to ourselves we could go where we liked just had to be back to catch the coach back to Leicester at 3pm. The weather forecast for Sunday the next day was wet and rain. Well did it rain it threw it down all day long. So after breakfast which was fantastic we went to the National gallery. These great works of art really did really did amaze me. The theatre was so packed I don’t think there was an empty seat. That didn’t seem to matter about the crowds the place was huge and the art work fantastic. Turner’s sky’s I thought were amazing, I must have a go at skies like that so much colour and action in them. Monet which didn’t really appeal to me and lots of others dating back hundreds of years. There were schools visiting and the teacher was pointing out and asking the children questions about the paintings. That was great to see. 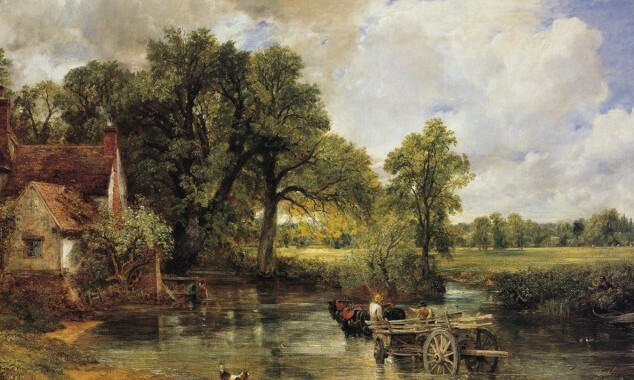 There was one artist however that really stood out for me and that was Constable and the Hay wain. In particular plus other famous works of his. For all you artists out there, this you will enjoy. it was a fantastic day out I really do recommend it. I came away fully charged and wanting to paint.